Recently, I had the opportunity to teach a session of Online Trading Academy's Extended Learning Track (XLT) - Forex. In the class, we were identifying potential trades that were to play out in the next few days to weeks. One of the comments that I made in the class resulted in a flood of emails being sent to me from the students. 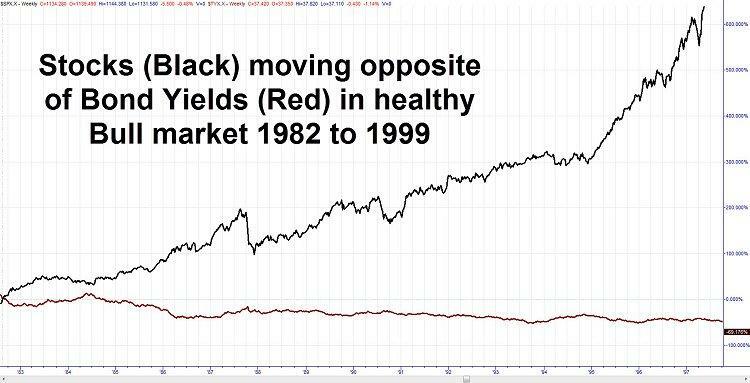 I was discussing inter-market analysis and mentioned that bonds and stocks tend to move together in the same direction. This came as a shock to most of the students who believed that the bonds and stocks should move in the opposite direction. In studying to become a Chartered Market Technician, I was required to study the relationships between asset classes, and as a trader, this has benefited me greatly. By understanding these relationships, a trader can identify potential shifts in trend, and confirm support and resistance. Additionally, one can also profit from multiple asset classes as you are already doing the analysis and may see the opportunities. Now to explain my statement, "Stock prices and bond prices should move in the same direction". Most traders believe that bonds are a direct substitute for stocks and are used as a flight to safety in times of trouble. That is partially true. When there are economic scares, the US Treasury stands as a safer investment than equities. This will cause a rise in bond prices when the initial shock of a possible stock decline hits. However, when one understands the relationship of bonds to the interest rates, you will see that this is just not possible for the long-term. Bond prices are inversely related to their interest yield. If rates in general go up, then someone selling a bond in the secondary market with a lower rate must drop their price to make the overall yield for the bond comparable to new offerings with higher coupon rates. If the rates in the market go down, then someone can sell their bond for more money if it offers a higher rate than what is now available. Businesses compete for investor money and also offer corporate debt (bonds) to finance operations. If the rates of Treasuries rise due to Fed action or a selloff in the bond market in general, then a company that wants to raise capital must offer higher rates of return on their bonds offerings. This higher rate of return is a larger burden on their balance sheets and causes less profitability and therefore, lower EPS. Couple that with higher borrowing rates for business and the consumer alike and you will start to see a slowdown in business. That slowdown will result in the liquidation of share holdings in search of better investments. Are stocks and bonds inversely correlated? 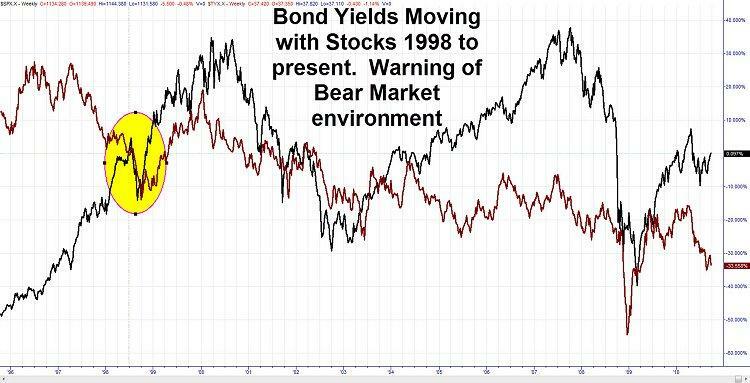 The following chart shows the inverse relationship between bond rates and stock prices in the bull market from 1982 to 1999. You can see that during this time of market and economic prosperity, we had a rise in both equity and bond prices. Let us compare this to the current long-term scenario. Many analysts believe that we have been in a long-term correction of the 82-99 bull market. 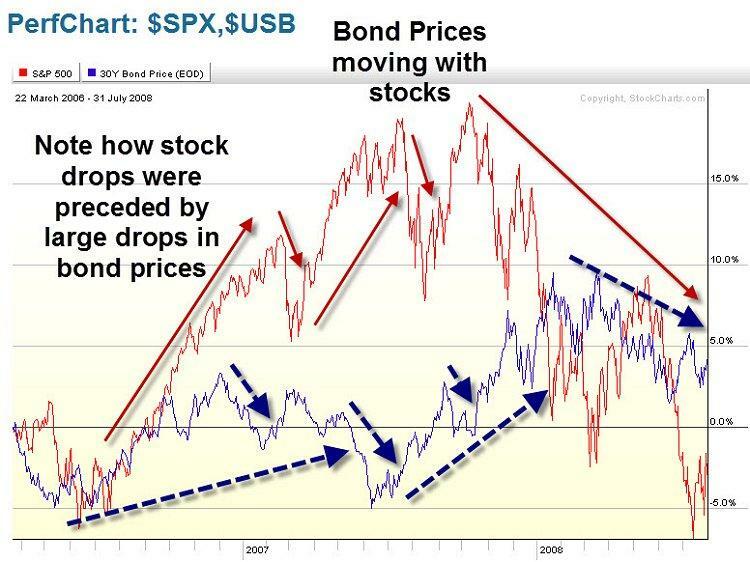 This is suggested by the unusual relationship between stocks and bonds. As you can see from the chart, they are now moving in opposite directions. This is not normal, nor is it healthy, for long-term economic growth. A rise in bond buying will cause the prices to rise and interest rates to fall. This allows for further expansion and consumption in business and a bull market for stocks. Due to this relationship, bond prices and stock prices should move in tandem in the long-term, with mild interruptions in the relationship at turning points. In fact, these divergences can be used as an indication of probable turns in the equities market. In the following charts, I have now charted bond prices against the equity prices. 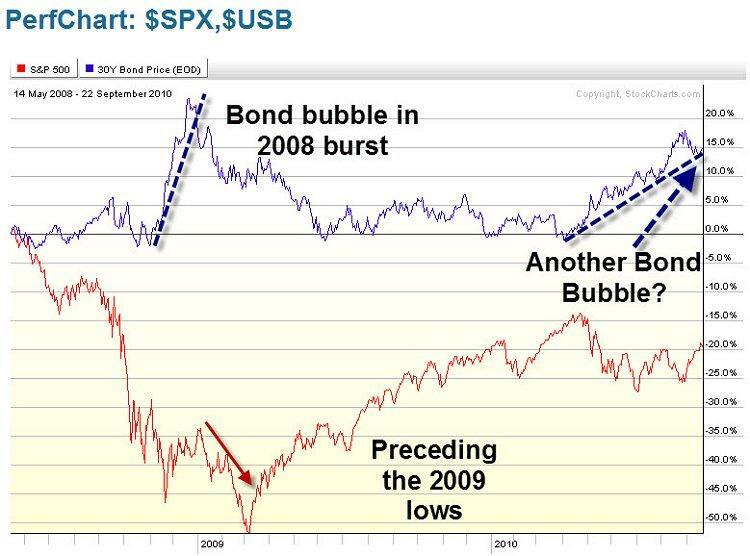 Look at how the bond price drops preceded most major drops in the S&P in 2007 and 2008. They gave us ample warning that the stock market was showing weakness and could not continue higher. Additionally, the bond prices rose dramatically in late 2008, causing a bond price bubble that broke just before the New Year. Using this sign along with other analysis, I was able to enter short positions and correctly trade the January 2009 decline to the March lows. So when you hear that bond prices and stock prices should move inversely, you should realize that the person stating that may be referring only to recent price action and not to the long-term. We are still in the midst of an economic slump and price relationships have not returned to normal to signal the return to American or even global prosperity. So for now, trade safe and trade well!